First Line: Bud Shumway pushed his dark brown Oakley sunglasses up onto the bridge of his nose, where, like fresh tar running down a sloped roof, they slowly began their journey back down to the end of his nose again. Bud Shumway's the sheriff of Emery County in south-central Utah, an area that's beautiful, remote, and sparsely populated. Wilma Jean is Bud's wife, but they see each other so seldom that Bud "wondered if he were really married or if she wasn't just a figment of his imagination, albeit a pretty one." Bud would like to spend more time with Wilma Jean, but that isn't in the cards. 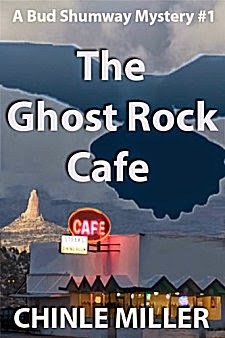 Someone keeps breaking into the Ghost Rock Cafe, and now an old hermit's body has been found not far away from there. On the surface, it looks like a cougar kill, and rumor has it that Bigfoot was spotted in the area, but this isn't Bud's first rodeo. The old hermit was killed by a man, not a big cat. All he has to do is start asking questions among the locals and the geology students and professors studying in the area to find out which one of them is a killer. But as good as a setting can be, I'm not going to keep reading if the story or the characters are bad. Fortunately the mystery has as many twists and turns as some of the trails Bud has to drive, and the characters are quite engaging. Bud knows how to keep his sense of humor around the local government penny pinchers, and most especially with his new deputy, Howie, who could try the patience of Mother Teresa. Bud's got a sharp eye for detail, too. Yes indeed, Chinle Miller's skill with her setting, story, and characters exceeded my expectations, and I know I'll be riding shotgun with Bud again in the future. If you like an intriguing mystery that's set out in the wide open spaces and filled with colorful characters, you should ride along, too. Cathy - The setting got my attention here too. And I like the fact that Bud isn't the all-too-common 'damaged protagonist who drinks too much.' Glad you enjoyed this one. Yes, Bud was a bit refreshing in that respect!